"I Need Out!" you say -- but have you tried God's way? He found a hole in the birdcage and fluttered out into my sunroom. Now what was I supposed to do? Quickly, I lowered a window and hoped that the little bird would find his own way out. Chester had no idea that I was there to help him though, and he took it upon himself to flit from window to window banging his beautiful blue feathers against the glass. “Oh God, help him to find the way out,” I prayed. I had been expecting a repairman that morning and when he came in, I explained my predicament. After admiring the bird’s beautiful indigo feathers, he told me that I’d better get him out because birds were known to knock themselves out against windows and die. I braved up then and grabbed my garden gloves. Chester had just knocked into another window and was taking a breather on the ground when I snuck up behind him, praying the whole way. Relief splashed over me when Chester let me catch him without a fight and later set him free. It was a beautiful site to watch Chester take flight and land on a branch that was way higher than any old cat could climb. You know, when I thought about Chester banging himself around from window to window in our sunroom, I thought about us and how we sometimes treat the ways of escape that God provides for us. When we’re trapped in a difficult situation, often we look to everyone and everything else but God. “I’ve got this,” we may tell God and ourselves as we bang our heads into walls and doors that we’re never meant to open. Or, maybe we don’t know who God is yet and are unfamiliar with his kind ways. Like Chester, we’re not willing to seek God’s way out or maybe we don’t even trust him to provide one. So, to us – we’re blinded to the possibilities of a benevolent Father who always makes a way for his kids. I remember hitting an all time low in my parenting years ago. 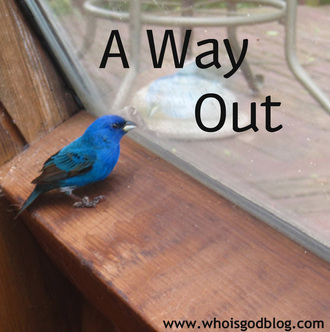 My husband and I were faced with a situation that seemed to have no solution and -- no way out. Very few people understood what we were going through and we found ourselves in a very dark place. One day, I was driving in traffic on a busy main road when I came up behind a delivery truck. My eyes fell on a sign mounted on its back door that pierced an arrow through my heart. The sign read: “God will make a way, when there seems to be no way,” quoting the song by Don Moen. It was just what I needed to hear. God would provide a way out. We just hadn’t found it yet, or maybe it just wasn’t the right timing for that door to open for us. Either way that sign on the truck was exactly what I needed. Are you looking for a way out today? Are you caught in a trap that has left you wounded from banging your head against your own walls? Who is this God who promises a way out? He’s waiting for you to seek him for it today.